Takes 15 Minutes , serves 6. Preheat oven to 400°F. Trim, rinse and drain the baby bok choy. Cut them in half lengthwise and place into a large bowl. Place all of the ingredients for the marinade into a small bowl and whisk together. Pour over bok choy and mix, either by hand or with tongs. 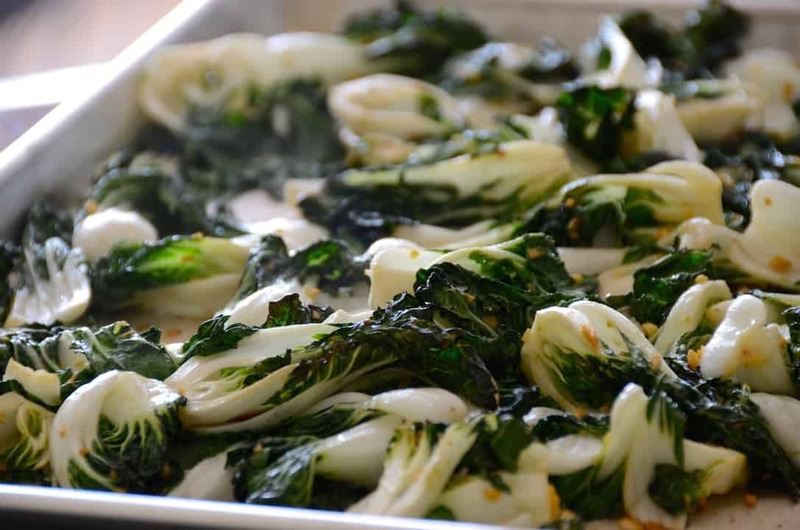 Place marinated bok choy onto a large parchment-lined baking sheet, moving it about to form an even layer. Transfer to oven and bake for 5 minutes. Remove tray from oven. Using tongs, turn bok choy over and move about on the sheet. Return to oven and bake for no more than 5 minutes, less if you like it more crispy. Transfer bok choy to an attractive service platter. Garnish with a squeeze of fresh lemon juice and sprinkle of kosher salt. Add additional chili flakes if desired. Serve immediately. In just 15 minutes, you can enjoy something that’s both easy to prepare and remarkably fresh and tasty. 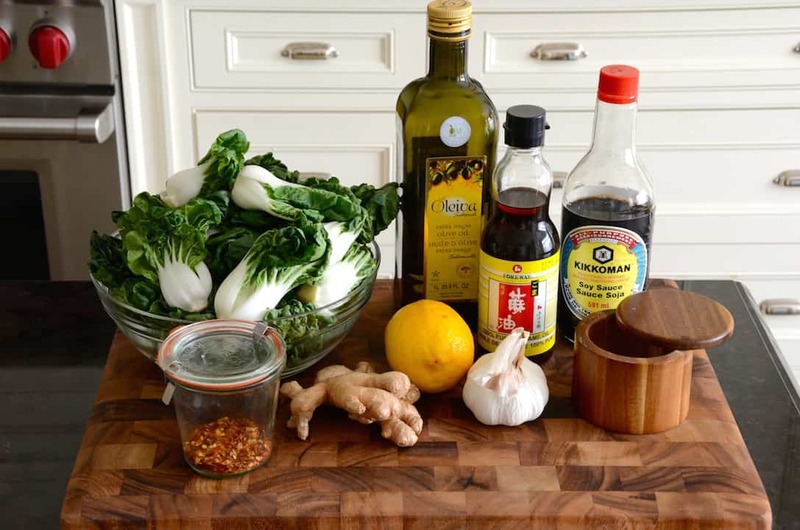 Who’s ready to try our BOK CHOY JOY RECIPE? It doesn’t happen often, but every once and a while I get to enjoy a weekend getaway where I play guest instead of host. Such was the case a few weeks back when my friends Peter and Loren invited a group of us up to their farm for the weekend. All had a wonderful time, and it was during this weekend that friends served some bok choy as a side. I instantly knew I had to try my hand at cooking up some goodness. The result is this BOK CHOY JOY recipe. 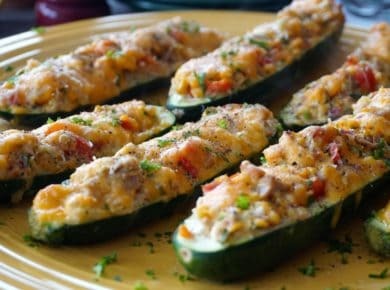 Before I describe what we did to create this easy, tasty side dish, a reminder to bookmark this page and PIN it to your Pinterest board – you’ll want to reference this story again and again! BOK CHOY – Bok Choy is a wonderful vegetable that works well in stir-fries, Asian-style soups such as Pho, and also roasted in the oven, as we’ve done for this recipe. Preparing it is as simple as trimming off any unsightly bits from the base and giving it a rinse and a spin. Now you’re good to go! I was lucky enough to find baby bok choy at my local supermarket and bought two packages because I love it so much. Although these dinky little wonders are small, they sure are mighty and people just can’t get enough of them. 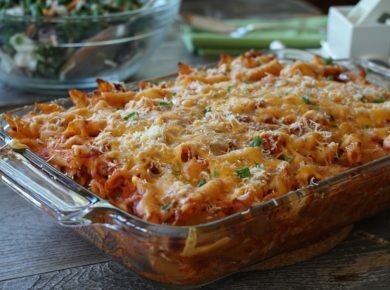 This recipe will serve six guests, no problem. 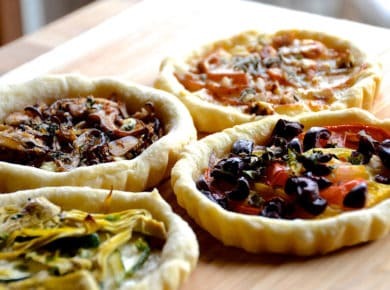 One suggestion on preparation is to not overbake them; it’s actually better to take them out of the oven before you think they’re done. They roast fast and just need to wilt a bit to produce maximum flavours. 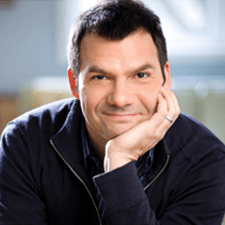 THE MARINADE – I’ve written a recipe out just as a reference, inviting you to play around with the quantities and develop something that best suits your taste. Make sure to watch the video tutorial we created to get a sense of the quantity of garlic and ginger I like to use. 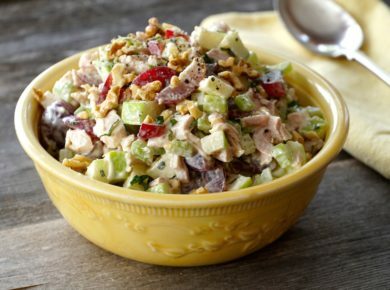 One thing to agree on: this recipe needs to be bold. 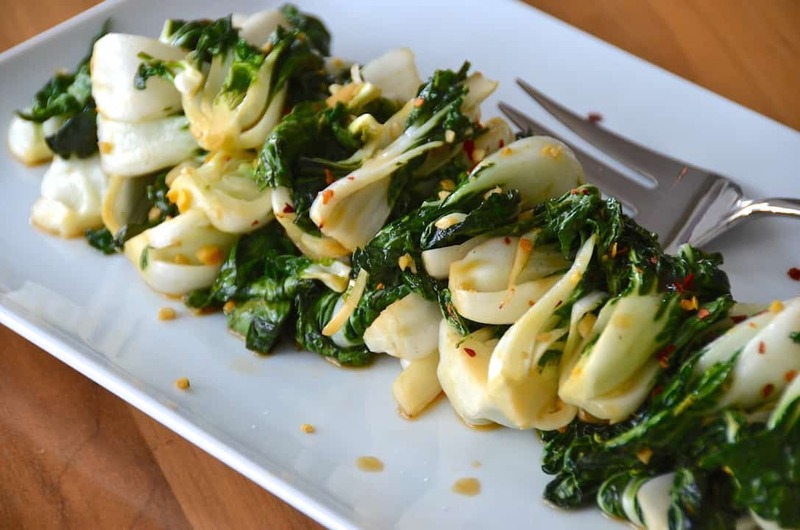 The chili flakes, toasted sesame oil, garlic and ginger get those little baby bok choy jumping and are a total joy for your taste buds. 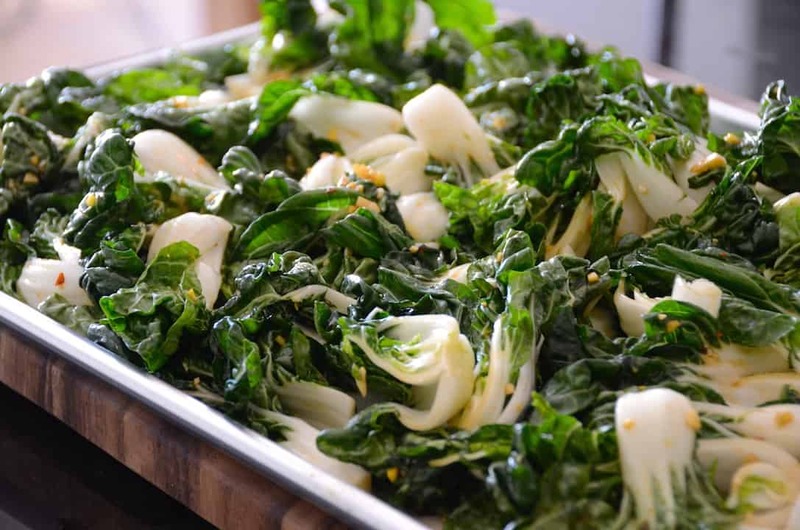 SERVICE – I’m going to suggest you arrange your roasted BOK CHOY JOY on a simple white dish. They’ll look appetizing on a round, square, oval or rectangular platter, but make sure to add a dramatic squeeze of lemon juice plus a sprinkle of kosher salt right before you serve. If you’re game and like heat, add a final sprinkle of chili flakes too; you won’t be disappointed. Here are a few suggestions on mains that we think would love to have BOK CHOY JOY as their sidekick. 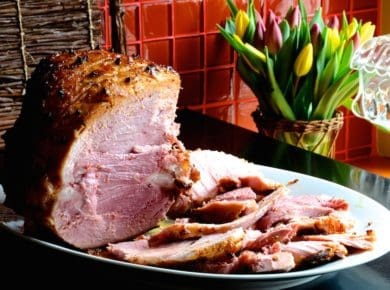 How about our ROASTED LEG OF LAMB or NANNY’S BAKED HAM? Both are crowd favourites and the bok choy will wait while you carve either of these mains tableside. 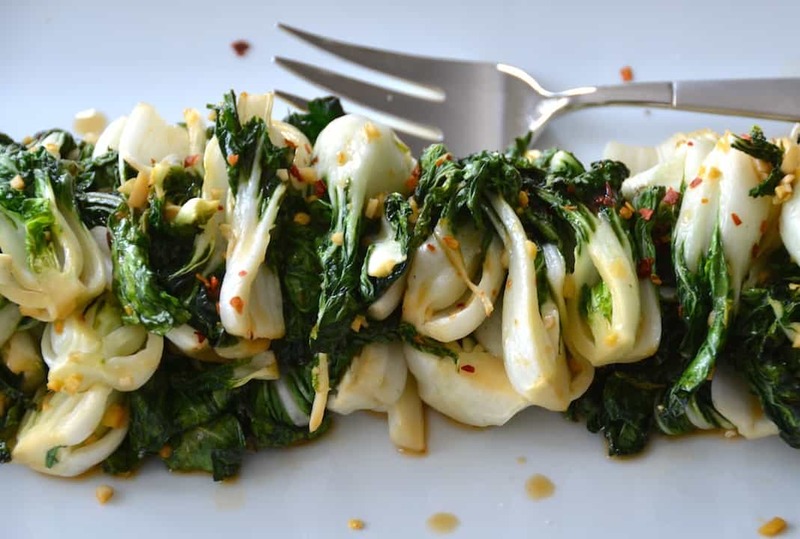 This BOK CHOY JOY RECIPE is for each and all. Sure is nice when a side dish takes centre stage!